One evening, Jesus invited me to come visit one of my favorite places in Heaven, a village called Fairhaven. I have taken many friends there, and this night I took 2 other people with me. As we arrived in the village, I was drawn to one particular shop; it looked to be an old-fashioned clock repair shop. As we entered the shop, one friend noticed a sextant sitting in the window. My eyes were drawn to an old man in the back of the shop, bent over a table working on something. Curious, we ventured back to see what was absorbing his attention. Spread out on the table were all the inside workings of a pocket watch. He smiled his greeting and beckoned us over to look. He was gingerly picking up each piece with seasoned skill, carefully fixing the broken pieces and putting the parts back together, but there was something different, something special, about the little wheels. I inspected one more closely; there was a whirling and spinning within the wheel. I was mesmerized. Looking intently inside of the tiny wheel, focused, I was amazed that it seemed to open into swirls of galaxies in deep space. I looked over at the old man in delightful wonder. My eyes were opened as they met His face. He chuckled at my delight as I gasped, “Oh Papa, it’s YOU!” I asked Him what He was doing, and He explained that each person has a timeline. This person’s time piece had been broken by the enemy, and He was fixing it. As I was drinking in His presence and His teaching, I thought about my own timeline. I had been to the courts of heaven and addressed accusations against me from the enemy. In court, Satan had been ordered to stop and to fix things he had messed with in my life. I didn’t understand why it felt as if nothing had changed, but I began to realize that while there are some things the enemy can put back and fix, he doesn’t know how to fix the timeline, only how to break it. It was becoming clearer. My next question was, “Papa is my watch not fixed yet?” He smiled and said He had been waiting for me to ask, and that the answer was both a yes and a no. He called out, “Son it’s time to show her,” and just then Jesus and several creatures of heaven came and stood next to the Father. Papa explained that He had much work to do, and instructed the three of us to go along with Jesus and see what He had to share. We followed Jesus through the back of the shop, walking past huge bolts of fabric. One friend mentioned that it must be where the fabric of time and space is kept, and that must be why there had been a sextant in the window. Jesus lead us to a towering ornate wooden door. Like everything in Heaven, it was extraordinary, but I was taken back by the composition of this remarkable door. As we approached, the door actually began to shimmer and pulse. We stopped outside the door as Jesus explained there was one order of business to attend to before we could enter. He required one friend, whose heart had been held by another, to completely surrender his heart before we could enter this place. The friend asked Jesus to be the only one to hold his heart, and then the doorway opened onto a huge platform in the middle of an great expanse of stars, moons, and planets, all swirling and moving in harmony. One of my guests was ushered to a theater-like chair, where he was shown that he could freely flip through a great panel of screens and look at timelines backwards and forwards. He was delighted and absorbed in looking at timelines. The other friend watched in wonder at what Jesus did next. Jesus took me over to the edge of the platform, gazing at the expense of space around us – stars and planets and galaxies displaying the glory of His creation. 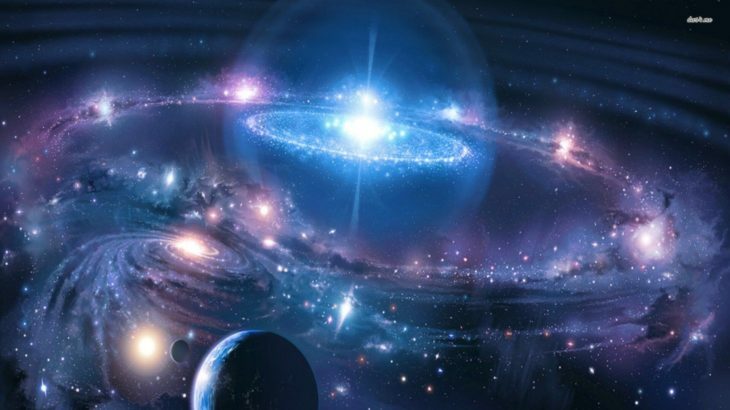 He pointed out that marring the perfect beauty of His space were many black holes, and He also explained that everyone had a space time continuum, their timeline of life. Jesus continued to explain that Satan, who had been Lucifer at the time of creation, was part of the council that watched as the Trinity created the universe. Satan has no clue how to create, but what he did learn from watching was how to destroy and damage the fabric of the space-time continuum. He has become very good at damage and destruction, and tearing holes in the fabric. My eyes lit up with understanding, and Jesus encouraged my processing, “yes, you are starting to get it!” Jesus went on to explain that even when Satan is court-ordered to stop and repair what he has broken, that he just has no clue how to fix some things. What that worm has been doing is literally using his hatred to punch holes in the “fabric” of our space time continuum, worm holes, that have left black holes of emptiness and loss. Jesus then captured my attention as He took my hand. He asked, “what do you really want?” He patiently waited as I gave several fluff answers, and then He caught my gaze with intensity. He looked intently at me and said with fierceness in His eyes, “I want to know what you really, REALLY want.” I responded, “I want to know how to get the enemy to repair all the holes he made in everyone’s timelines.” Jesus sighed in acknowledgement, confirming that is the problem; the enemy can not fix everything that he has broken. He is not able to repair some things, he can only damage them. I responded to Jesus that they can’t just stay this way – that isn’t right. He spoke tenderly to me, “you are correct, My dear.” His voice was so full of love as He encouraged, “the good news is that you can repair them.” I was stunned at His answer, even though I shouldn’t have been, and asked Him, “how can this be?” He responded with a question. He asked if I was not made in His image, in the image of the Father. “Well, of course I am,” I replied, “but You are the Creators and I am not!” He reminded me of certain scriptures. Now Jesus asked me a question. “What has been your greatest passion in life?” I immediately said, “color, of course! You already knew that.” Jesus smiled at me and said “yes, because I created you that way. I placed that love of color inside you for this time and purpose. Your DNA is woven with color – not the colors of earth but all the colors of Heaven.” Color and color theory have been my passion since I was a young girl, enjoying and exploring color with crayons and painting. As an adult, I traded crayons for palettes and used my love of color as a makeup artist for film and television. An intrinsic longing to share my love of color and teach it drove me to establish a successful makeup academy, traveling the country educating others about color, how to minister to people as makeup artists and masters of color theory. When I was being woven in my mother’s womb, He was weaving me with color. Prophetic, Religion Apostolic, christian, color theory, cosmos, courts of heaven, heaven, Jesus, michele ahlswede, ministry, prophetic, religion, ruach, wandering lipstick. permalink.